How big is the type design industry? I'm not sure if this has been discussed in the past (at least I couldn't find anything on this topic), I was wondering if somebody knows the estimated value of the type design industry? How big is it really? Based on a current report, the global Graphic Design industry generates a whooping $56 Billion in a year. Considering fonts are also part of the Graphic Design industry, what would be the estimated worth of type industry? $5 Billion? $10 Billion? 20 Billion? A look at Monotype's turnover (x2, x1.5?) is probably not that far off. The value of the businesses. The sum of the price you would put on all the companies. The annual revenue of the business. Just to illustrate the difference, a company might be only breaking even and the value of the company might be less than their annual sales. Or they might be highly profitable and be worth 10x their annual revenue. I will add that as a very broad ballpark, the annual revenue of all retail font sales and font rental might be on the order of $100-200 million USD. Certainly nowhere near $5–20 billion. Monotype Imaging Holdings (NASDAQ: TYPE) a Delaware, USA corporation founded as Lanston Monotype Machine Company in 1887 acquires Lotus F1 for USD 50 billion in cash. The new livery seen during testing ahead of the Shanghai Grand Prix. 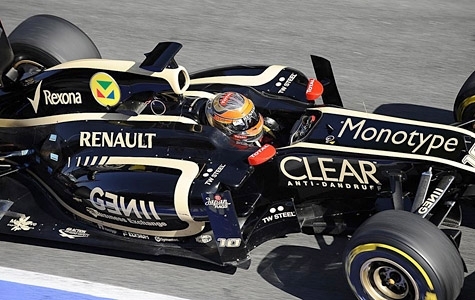 Former Lotus F1 owner Proton was unavailable for comment on its divestiture, however sources close to Monotype indicate that driver Romain Grosjean, contracted to Lotus F1 for an undisclosed number of seasons was the type founder’s principal intended asset acquisition. According to recent research by Dr. Shelby Greendler, head of the Communication & Edumacation Program at Lambada College in Vancouver, Canada, Grosjean is a direct descendant of both Philippe Grandjean, the personal typeface engraver of French monarch Louis XIV, and famed former Monotype employee Beatrice Warde (resulting from an extramarital affair while using the assumed identity of Paul Beaujon). Greendler has further uncovered that Grosjean changed his surname from Grandjean in order to evade persecution by Alphabetties, a typeface aficionado group seen by some as a shadowy militant-feminist font cult engaged in stalking masculine type designers. Five court cases against Alphabetties members are currently pending and the Type Directors Club of New York is eagerly anticipating its key figures to face arrest as early as May of 2023. In a controversial allegation however Greendler has been fingered as a secret founder of Alphabetties, with detractors claiming she is now running a splinter paramilitary training operation known as Type Kamp. 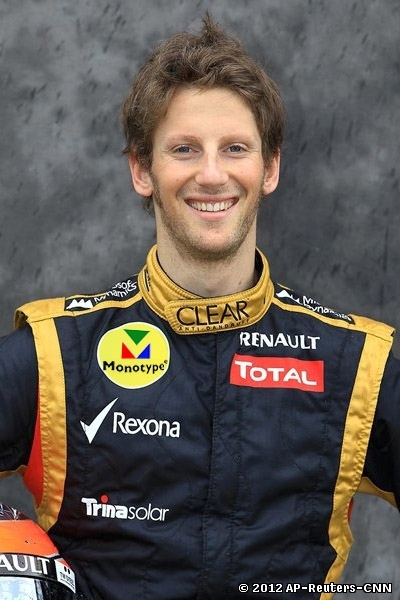 Press photo of Romain Grosjean. Grosjean, a covert member of the Association Typographique Internationale welcomed Monotype’s acquisition, revealing his previously undisclosed ambition of eventually moving up from his Super-License to designing fonts. However team sponsors Renault S. A., Clean Anti-Dandruff and Rexona Deodorant have expressed concern that the move might adversely impact their ability to leverage their own typographic assets. Renault in particular is threatening legal action centered on former employee Pierre Étienne Bézier’s reputed patents covering the mathematical definition of curves, which Renault claims are relevant to a few Monotype fonts. Concerning the future of Grosjean team-mate Kimi Räikkönen, sources within the Formula 1 industry indicate that the renewal of his driving contract is contingent upon a change of name to Italique Hämäläinen. However according to the same sources Räikkönen’s manager Steve Robertson has made it clear that his client would not accede to being a subordinate driver. Hi Hrant, thanks for this. Where can I find an online link to this news? I think there's a question to consider about the size of the industry: for companies like Monotype, Microsoft, or Adobe that have large business units that don't involve type, are trying to just estimate the size of the type-related parts of their activity? Where can I find an online link to this news? Dave, following with a time machine? Hmm. When was that announced? Or perhaps you have inside information? The last I heard that is deader than Donald Trump's chances. Hrant, please [clarify] yourself. Joke or not. Calling the Alphabettes a militant-feminist group is not very funny. I admire and value the Alphabettes organization, and respect virtually all its members. I also happen to value militancy and feminism. I wish your (plural) reaction was a parody as was my post, but sadly it's more like a tragicomedy. Opportunistic, blind outrage has become the curse of our generation (irrespective of gender). It is not the way forward. So, a part of my argument would be that Google's involvement in fonts might have provided exactly the kind of stimulus that was needed for everybody to prosper. The other problem I see with trying to put a number on "the font industry" is that it's too intermingled with other things to slice off the part that's just fonts and say, aha!, THAT's how big the "font industry" is. Fonts are a part of a larger mix and tough to put a finger on separate and apart. I'd probably get reported for this comment, here you go. Monotype's numbers are £8,710,896 reported in 2015. See attached pdf made to the public by Companies House gov uk. That's Monotype Ltd., their UK subsidiary. Confused by that, as Monotype as a foundry (not as a Manchine) was founded in the UK it wouldn't be a subsidiary, I think. Monotype on Companies House is listed under other names such as "Monotype Imaging Inc" which is what they have copyrighted themselves on their current site. This might be more helpful: http://ir.monotype.com/investor-relations/press-releases/press-release-details/2016/Monotype-Announces-Third-Quarter-2016-Results/default.aspx Granted, not everything they do is part of the type industry per se, but it's way more than Monotype Ltd.
That’s the 2015 annual report of MONOTYPE IMAGING HOLDINGS INC. which is listed on NASDAQ as TYPE. Total revenue for 2015 is $192.4 million (see page 13 of PDF). The Creative Professional division’s revenue is $88.1 million. That looks like the directly retail fonts related revenue. This should include all the reseller platforms as well as foundries (incl. Fontshop and FontFont, acquired in 2014). As far as I understand their annual report wording, the rest (54.2% or $104.3mm) is OEM revenue which does not seem to directly be retail-related revenue, but instead embedded device and software licenses, printer drivers, and other technology. I’m not sure if there’s an exact breakdown of this in the annual report, but I haven’t had enough time to read. p42 indicates that they have a few big OEM customers, "For the years ended December 31, 2015, 2014 and 2013, our top ten licensees by revenue accounted for approximately 33.5%, 35.3% and 37.2% of our total revenue, respectively". If you take 88mm as MT’s share of the type market in 2015 (or more depending on what OEM revenue includes), the question is really how much of the market that is. The more precise question is then also one of language and alphabet support, as MT’s library probably skews more towards Latin, Cyrillic, etc. Maybe, a split between CJK and everything else makes the most sense. The last time I looked at this more deeply, I also looked at Adobe’s annual report. From there on, you can try to estimate some of the larger foundries by head count, and possibly you’d use back catalogue revenue multipliers for older, successful foundries. There’s also (a few) independent resellers left, with some geared towards the widest possible market, and others that are highly selective resellers or foundry networks. And then of course all the smaller foundries that don’t sell on MT. From there on out, it’s anyone’s guess. @DanRhatigan I never know how any company organizes these sorts of things. We have a client who has banking in the supermarket division! I don't get the feeling there's a universal logic to it. 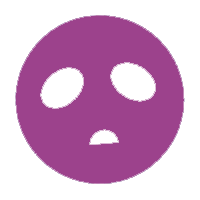 Out of curiosity, can you please tell us what is covered by the Creative Professional Business division/line item? "TYPE" has a market cap of $824.36M, but even if the rest of the industry had a valuation in excess of $1.2B it would be hard to make the case. For that statement to be accurate the industry would need to be generating annual revenue in the billions. That's my five ¢. @Katy Mawhood It’s a business in the realms of a few hundred millions, especially if you account for non-Latin type, but as @SiDaniels said, definitely not multi-billion. Actually non-Latin type is still probably a very small part of real money spent. Given the launch events/activity, it seems to me when multinational companies like Canonical or Nokia or Sony pay MT or DaMa or whoever to make big multi script families, it's the biggest ticket deals around. Not to mention the dollars Google sunk into the Noto fonts. Also Chinese and Japanese fonts are expensive, and I'd wager that a lot of money is being spent in that space. Latin likely has the volume, but there's definitely money in non-Latin. What proportion of the business is custom versus retail?